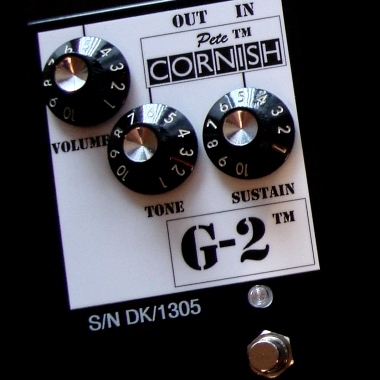 The G-2™ gives a higher level of overdrive for that classic cranked up Marshall sound found on most British rock records of the 70s Led Zeppelin, Free, Bad Company etc. The G-2™ with its warm Germanium qualities and higher gain starts at around the rhythmic crunch stage of the SS-3™ and continues through in controllable degrees to a rounded but dynamic lead. The input to this unique device is our universally acclaimed High Impedance, Unity Gain, Class A, Buffer Preamp with its superior RFI rejecting capability to eliminate Radio Station interference and Low Impedance output, allowing the use of extended cable runs from the G-2™ in bypass mode. The fixed High Impedance load presented to the Guitar allows the pickups to operate at their optimum, even when several effects units are connected after the G-2™. The Unity Gain Buffer also prevents Ghost Distortion being audible in Bypass Mode. This effect unit gets the most benefit from being fed into a clean, full frequency response amplifier and I recommend that when you receive your pedal you connect it up without anything else in line, just Guitar/Pedal/Amp, and discover the way the controls interact, both with themselves and the guitar/amp controls. Then adding the rest of your effects, you may find that you need to make slight adjustments to these as they are now being fed with a constant signal when the G-2™ is in Bypass Mode. DC adaptor: the size of the coax connector is 5.5/2.1mm and the centre pin is negative -VE. The voltage rating of the adaptor should be noise free, fully stabilized at 9.6V and capable of supplying 20mA. We recommend the use of the BOSS PSA series adaptors PSA-100/110/220 or 240 depending on your local AC supply voltage as meeting the above criteria and cannot accept any liability for damage caused to this unit by the use of, or to, any other type of AC/DC adaptor.